Is the Internet of Things the Future of Every City? As technology integrates more and more with the tasks we perform each day, we are forced to think about how we structure urban spaces to include a digital skin. Some cities have already started the revolution, creating smart spaces by harnessing the ability of machines that ‘talk’ with one another. The technology even has a snappy name - the Internet of Things. 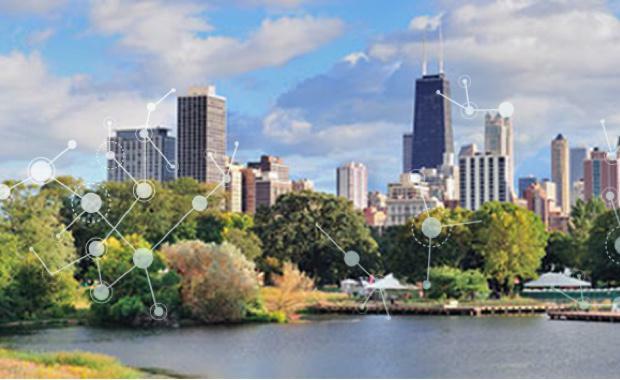 Cities such as Barcelona, Helsinki and Chicago are rolling out programs to improve infrastructure, livability and sustainability by including ‘smart objects’ and sensors to create a network of things that can monitor and even control events occurring in the urban environment. Such networks can help systems and people respond to data in real-time. The potential in this area could have a great impact on critical issues in the public sphere such as reducing energy consumption and creating a more sustainable economy. Can you imagine, for instance, the impact of a street lighting system that activates only when someone is driving or walking down the street? What amount of greenhouse gas emissions could be saved across tens of thousands of lights that are currently in use all night?The prospect of creating technological solutions to the problems that cities encounter frequently is attracting big tech companies such as Cisco and IBM to invest in making smart cities. Global technology group Cisco has predicted that the Internet of Things will generate $19 trillion globally over the next decade, including $4.6 trillion from the public sector, it makes sense that cities begin to seriously consider incorporating these technologies into their urban landscapes. With so much economic potential created by investing in this technology, a kind of race has formed among cities and tech companies to realise the integration of this technology with the hope that it becomes a global trend. And the cities that are winning this race are not necessarily those you might suspect. Songdo, South Korea, a relatively small city built fifteen minutes from an airport, is a contender for the top position. The city was built from scratch on barren land to cater to internationals arriving at the airport and was designed to be a technologically advanced city. As reported in Mashable, underneath Songdo's streets, sensors detect traffic conditions and alter signals based on congestion. These sensors connect to cars via radio identification tags that report gridlock. Other sensors in the city monitor saltwater flow in Central Park. "In Songdo International Business District, nearly all aspects of life are digitally networked, from sensors that help control traffic and public transportation schedules, to Cisco TelePresence-based personal video services linking residents to businesses and service providers, to the centralised control systems that manage city services like waste disposal and energy generation," says Gale Executive Vice President- International Tom Murcott. Gale is the group developing Songdo. In Australia, Adelaide is taking the lead in transitioning towards this new era of smart cities. The South Australian Government and Cisco have forged a partnership and this year declared Adelaide to be the ‘Lighthouse City in Australia’ for Cisco’s initiative of creating smart cities. Adelaide joins Barcelona, Chicago, Hamburg and Dubai as leading places to showcase Internet of Things innovations under Cisco’s initiative. As part of the agreement, the Adelaide City Council has implemented free Wi-Fi throughout the Central Business District and set up an Innovation Hub for tech entrepreneurs to congregate and meet. However, the transition towards offering more technological infrastructure is not only the purview of Adelaide. Increasingly, the capital cities of Australia are undertaking new initiatives to integrate sensing technology and smart objects to solve some of the cities greatest problems. In Brisbane, for instance, the city council is proposing trials for in-ground sensors that monitor whether or not a parking space is being used or not. The capacity of this data could allow drivers to know in real-time where free parks are, which could stop them from using up petrol and emitting green house gases while they drive around trying to find one. While this indicates Australian governments are playing with the idea of creating smarter cities, some speculate on the willingness of our governments to move towards real change. When the hallmarks of cities that are journeying towards becoming smart cities include excellent Internet capabilities, investment in development and progressive governments, the question is: will Australia evolve to match world cities that are transforming into technologically sophisticated systems with the potential to positively impact issues like population density and climate change in our future?